Titanium corrosion or more precisely, the lack thereof, is the concept that is the primary basis for many titanium applications. The established image as non-corrodible material that was gradually built around titanium, went a great deal for choosing titanium metal as a possible solution or alternative, even in applications that are not ideally suitable for this expensive and, unfortunately, still rather scarce glamour metal. It would be incorrect to denominate titanium corrosion resistance as a myth, although the way the concept is used in modern industry, would certainly hint to this status. Remarkably, professionals and metal experts never assert that titanium is not corrodible, but rather assess the great resistance of titanium to corrosion resistance, especially when compared to its main competitors in structural metals field – steel and steel alloys. Obviously, all metals corrode; give the right set of environmental factors. We are usually interested in the “spontaneous” corrosion – which is roughly the corrosion that happens when pure metal is exposed to the atmosphere, without any other special altering factors (elevated temperatures, for instance); that’s why titanium corrosion seems so unlikely. The most corroding agent existent in Earth atmosphere, that is, in the air that we take in with each breath, is obviously oxygen. The other major constituent, nitrogen, is remarkably neutral; so neutral, it was nick-named “dead air” when the scientist initially began to study it. Intuitively, you may believe that titanium would display a low affinity with oxygen, thus explaining its great corrosion resistance in normal atmosphere. But it is the contrary great reactivity with the oxygen that actually explains the greater corrosion resistance from oxygen. That doesn’t sound right, isn’t it? Well, it will, after you read the following paragraphs. Let’s try a metaphor. I suppose everybody has experienced, in more or less detail, the tricky process of frying hamburgers. Imagine a hamburger placed on a hot plate, attended carefully for a couple of minutes. You get a tasty treaty, right? Throw the same hamburger directly into the open flame. You only get a burnt piece of meat, raw in the inside, and you could consider yourself lucky if you could convince your dog to eat it. The key concept here is “raw in the inside”. Titanium has a great reactivity with oxygen. It is that great that a vacuum, oxygen free environment is required to undergo laser welding. When “raw titanium” is exposed to the oxygen from atmosphere, it “burns”, forming a crust, in the form of a microscopic layer of titanium oxide, which deters further reaction with the oxygen. Is this passive layer of titanium dioxide that is the core constituent of titanium mythical resistance to atmospheric corrosion. Titanium corrosion resistance is further enhanced by the fact that this layer is “self-healing” should it become scratched or in other way removed. While titanium is resistant to most normal environmental situations, it is not immune and can be susceptible to pitting and crevice attack, especially at elevated temperatures. It is, for example, not immune to seawater corrosion if the temperature is greater than about 110oC. Titanium offers moderate resistance to reducing acids such as hydrochloric, sulfuric, and phosphoric. Corrosion rates increase with increasing acid concentration and temperature. 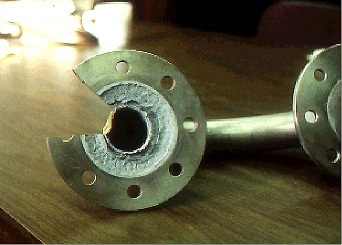 Severe corrosion damage on titanium equipment has resulted from cleaning procedures utilizing pure hydrochloric acid. However there are special agents that can be added to effectively inhibit the corrosion of titanium, if titanium elements need cleaning by hydrochloric or sulfuric acid. But this is a story for some another time.